Autoimmune diseases are conditions in which an individual’s own immune system mistakes its own tissue (joints, organs, etc.) as an infection or foreign substance. The immune system then creates antibodies to attack the tissue(s) it identifies as problematic, causing destruction to the structure (joints, organs, etc.). There are at least 150 types of autoimmune diseases and nearly any body part can be involved. Due to the wide variety of possible antibodies that can be produced, symptoms of autoimmune disease vary greatly. Joint pain, thyroid imbalance, dry skin, chronic fatigue, neurological issues, gastrointestinal issues, and more can all be a result of an autoimmune disease and symptoms will typically “flare up” during times of stress, infection, or following trauma/injury. It is conservatively estimated that over 50 million Americans are currently suffering from an autoimmune disease. Autoimmune disease is also the #1 most popular health topic requested by callers to the National Women’s Health Information Center. 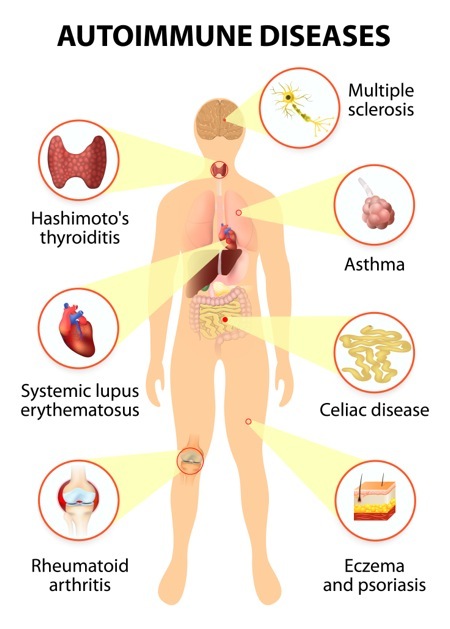 In recent years, the rapid growth of autoimmune disorders (autoimmune symptoms without the specific medical parameters used to diagnose specific disease) has been a challenge for many patients and clinicians alike. This is due to the current “treat-the-disease” approach rather than a “treat-the-patient” approach. The former approach often results in many patients with undiagnosed autoimmune disorders being left untreated or simply receiving symptomatic care. The health costs of autoimmune disease (not even including autoimmune disorders) in the United States are twice as much as cancer costs per year, and these costs continue to rise as the number of people diagnosed with autoimmune diseases continues to rise. The traditional approach to autoimmune disease is to use immunosuppressant drugs to weaken the immune system and decrease the attack on healthy tissue. Though effective at slowing the immune system’s assault, these drugs leave the individual more susceptible to serious infection and cancer, all while neglecting the true cause of the immune system dysfunction. At the Balanced Body Center, our approach works to find what is driving the immune system to malfunction. We focus on regulating immune system activity to reduce autoimmune symptoms, while still allowing the body to maintain its natural, proper immune function. All of our patient care begins with a detailed history which allows the patient to tell their story and explain their symptoms. This information will be further investigated with a physical exam and comprehensive blood work that will be used to determine the most appropriate course of action. Previous blood work is welcome for review and if further blood work or testing is needed, our doctors are able to order these specific tests. Since there are many different etiologies for autoimmunity, complete chemistries are important to assess the overall function of all the individual’s body systems to determine the most appropriate course of action. The altered systems, and the extent to which they are altered, provide clues as to what is contributing to the immune system dysfunction. This provides our doctors with the information needed to customize a care plan specific to the individual’s needs. Our doctors spend the time necessary to understand the history and extent of the patient's problem. It is these details that help our doctors determine the tests necessary to find the cause of the condition and to develop a subsequent treatment plan. The GI tract has many defenses to keep unwanted substances (bacteria, toxins, “large” food particles) from entering the blood stream, so it can eventually pass them through the bowels. The first line of defense is the cells of the gut wall that are held together tightly to prevent unwanted materials from being absorbed. However, the bond between these cells can be compromised by antibiotic use (which disrupts the balance of good to bad bacteria in the gut), high sugar diets, and toxic substances in food and water that start to break down or loosen these tight bonds. Once these bonds have become loose, larger food particles, toxins, and bacteria can pass through the gut wall. This causes the immune system to launch an all-out assault on these particles in order to prevent them from traveling throughout the body. As more of these larger particles and toxins are absorbed, the immune system responds more aggressively and can cause inflammation throughout the entire body. If this continues, the immune system may begin to create specific immune cells (antibodies) to attack these absorbed particles. Once the immune system starts making these antibodies, it will always be prone to making more. However, by repairing the gut wall and eliminating substances that activate the immune system (toxins, bacteria, food sensitivities, etc. ), a reduction in the number of autoimmune antibodies can be achieved, thus reducing or alleviating autoimmune symptoms. Our doctors utilize a range of advanced diagnostic tests such as comprehensive blood panels, organic acid testing, gut permeability tests, and food sensitivity testing to assess the integrity of the GI tract wall. The results of these tests help us to determine the extent and cause of “leaky gut” and to ensure the proper interventions are taken in order to repair the lining of the GI tract and thus calm down the immune response that can be detrimental to your health. Hundreds of studies have demonstrated that there is a strong connection between gut bacteria, yeast, and overall health. Overgrowth of bacteria/yeast (i.e. a higher prevalence of “bad bacteria” over “good bacteria”) has been found to be causal in many autoimmune diseases including rheumatoid arthritis, sarcoidosis, inflammatory bowel disease, Type 1 diabetes, Hashimoto's disease, and more. Gut bacteria works closely with the immune system to help regulate proper communication between immune system cells (T-Regulator Cells). When the balance of bacteria is altered, immune system function is also altered, often resulting in autoimmune conditions. Antibiotics, high sugar diets, and toxic substances in food and water can all have an effect on the bacterial environment of the GI tract. By re-establishing proper bacterial balance in the GI tract through dietary intervention, orthomolecular therapy (high quality supplementation), and probiotic use, proper immune function may be restored. Our doctors have protocols in place to assist patients in re-establishing proper gut bacterial balance which will help restore appropriate immune system function, resulting in a decrease in autoimmune symptoms. More research is showing that early exposure to chemicals and toxins can impair immune function. Some of these toxins include mercury, aluminum, chloride, fluoride, cadmium, arsenic, and lead. With increasing amounts of exposure to these harmful elements from environmental pollution, food treatments, packaging, and additives, it is essential to evaluate these levels in any patient with an autoimmune disorder. Our office offers a heavy metal analysis test and can provide natural treatment protocols to help eliminate the toxicity that’s identified. While research has yet to discover the full range of negative effects environmental toxins have on the body, it is evident that there are many everyday chemicals that commonly build up in the body and cause harm to our overall health. Every day we are exposed to hundreds of toxic chemicals from sources like pharmaceuticals, pesticides, packaged foods, household products, and environmental pollution. As we have become more exposed to chemical-laden products and to toxic chemicals in food, air, and water, we have been confronted with an accelerating rate of chronic illnesses, including autoimmune disorders. The Balanced Body Center offers the GPL-TOX test to evaluate for the presence of 172 different toxic chemicals, including organophosphate pesticides, phthalates, benzene, xylene, vinyl chloride, pyrethroid insecticides, acrylamide, perchlorate, diphenyl phosphate, ethylene oxide, acrylonitrile, and more. This profile also includes Tiglylglycine (TG), a marker for mitochondrial disorders resulting from mutations of mitochondrial DNA. These mutations can be caused by exposure to toxic chemicals, infections, inflammation, and nutritional deficiencies. All of these can alter proper immune function. Food and chemical sensitivities are also increasing at epidemic rates. While the exact causes of these sensitivities are not fully understood, it is evident that they are due to a number of environmental and lifestyle factors. However, these conditions continue to be ignored by many physicians. A food sensitivity develops when your immune system reacts in an attempt to reject a food in your diet. An autoimmune reaction is an event where the immune system is reacting and attacking substances that it should normally recognize as harmless. There are four different types of autoimmune reactions: types 1, 2, 3, and 4. More than one type of reaction can occur at the same time in the same allergic individual. These reactions are well documented in medical literature and are referred to as the Gell Coombs classifications. It is the type 2 and 3 reactions that can affect mood, energy, mental clarity, and autoimmunity. Types 2 and 3 are delayed autoimmune pathways and cannot be checked using traditional medical scratch testing that is used for general allergies. Once a delayed food or chemical sensitivity is identified, a specific course of elimination and rotation must occur to allow the system to heal. Our office utilizes advanced blood testing procedures to identify and correct these conditions. Our office can also customize food allergy panels to the patient's needs. It has been well established over the years that hormonal balance is crucial to proper immune function. Despite this knowledge, many factors continue to be overlooked in the treatment of autoimmune disorders. Our office utilizes advanced thyroid blood chemistries, male and female hormone profiles, adrenal testing, and neurotransmitter testing to reveal the hidden causes of these disorders. Proper evaluation can reveal slight thyroid imbalances, reduced DHEA, increased cortisol, metabolic syndrome, decreased serotonin, hypoparathyroidism, hyperparathyroidism, decreased estrogen, decreased testosterone, and many other factors that can contribute to or cause immune system dysfunction. It is essential to restore balance to these systems naturally to ensure optimal overall health and to relieve symptoms of autoimmune disease. Many organs and systems can be damaged by autoimmune processes. Even after the immune process has been managed, damaged systems may require further nutritional aid to reduce inflammation, promote healing, and restore proper function. Targeted, high quality diet and nutritional supplementation are key in healing damaged tissue and preventing further symptoms. Our doctors are trained in the proper supplementation needed for each system and will work with you to customize a diet and supplementation regimen to restore proper function and optimize your health. Our office offers a complete approach to autoimmune disorders that includes modern diagnostics and holistic treatment plans. We also work closely with a network of likeminded practitioners in other offices to provide the best possible care for a variety of challenges that are often associated with autoimmune disease. We believe everyone should have the opportunity to enjoy a high quality of life, which is why we use an integrative team approach to ensure that all aspects of autoimmunity are addressed.